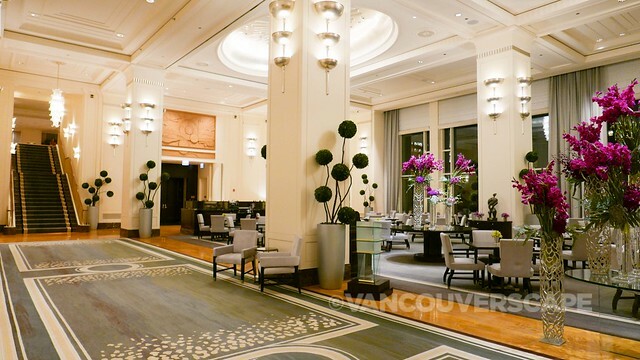 In town to explore Chicago and cover the second-ever Laver Cup tennis tournament, I spent two nights at five-star luxury hotel The Peninsula Chicago. 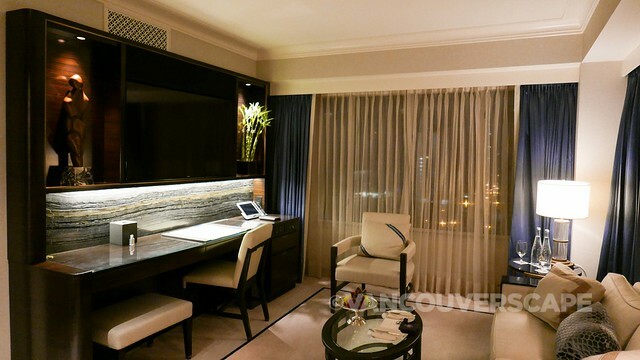 There are dozens of luxury hotels to call home along the Magnificent Mile, however I had yet to stay at a Peninsula Hotel, a chain renowned for its Asian hospitality, so on a very late Tuesday evening, I arrived to begin a two-night stay. Everything about The Peninsula rings first class. 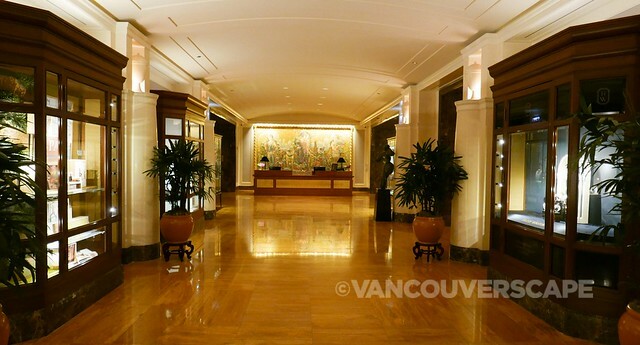 The marble lobby is graced by beautiful artwork and furnishings. 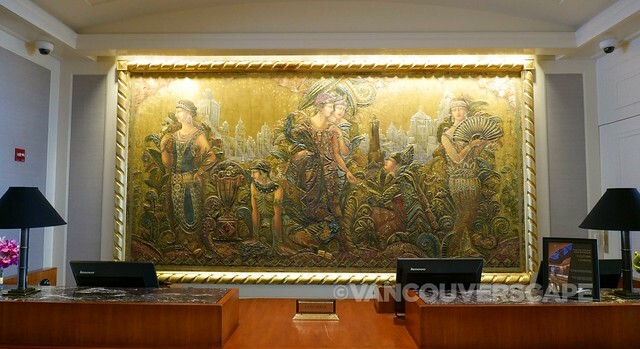 Behind the concierge desk is a magnificent 15 x 7-foot mural by French artist Gerard Coltat, created exclusively for the hotel in 2001. This textured oil and sparkling gold, silver and copper leaf piece fuses French Art Deco and Art Nouveau styles. Six colourful figures in elaborate flowing dress can be seen amid Chicago’s famous Tribune Tower and surrounding buildings. My spacious Executive Suite makes the start of my Chicago visit a trip to remember. 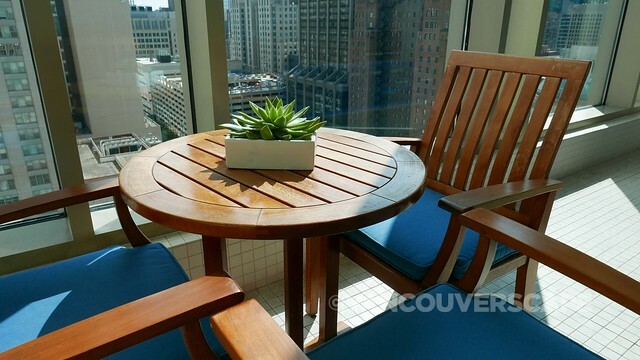 There’s floor-to-ceiling window views of downtown (and several rooftop pools!) to take in, even from the marble-topped soaker tub in the bathroom. Bathrooms have smartly arranged towel hooks and adjustable lighting to help minimize the hotel’s environmental footprint. 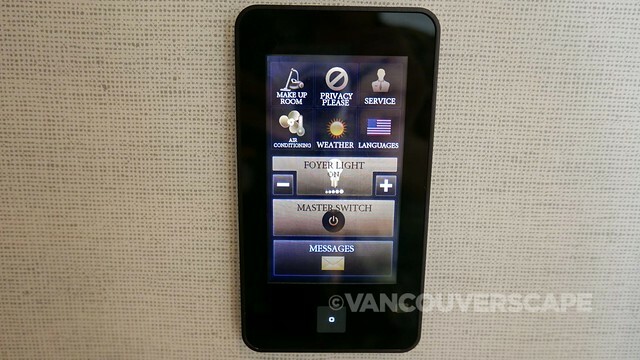 Mood lighting in all rooms can be adjusted via wall-mounted touch screens, from entry all the way through to the bedroom. There’s 11 different languages in the system, and when you select a language, the entire room will update its menus in your chosen language. Via digital tablets, guests can track airport information, make housekeeping requests, check out dining menus, and connect to PressReader for over 7,500 media publications. There are also international radio options and a wide range of music and TV stations at your fingertips. 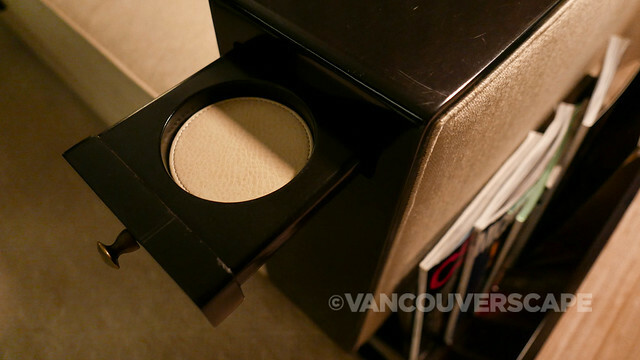 The built-in vanity contains a sculpture and lucky bamboo arrangement; by the door is a beautiful Asian cabinet that holds snacks, tea, coffee and Nespresso coffee machine. There’s also a stocked mini fridge on one side of the cabinet. The china is custom-made featuring a chrysanthemum motif, one of the four noble flowers of Asia. 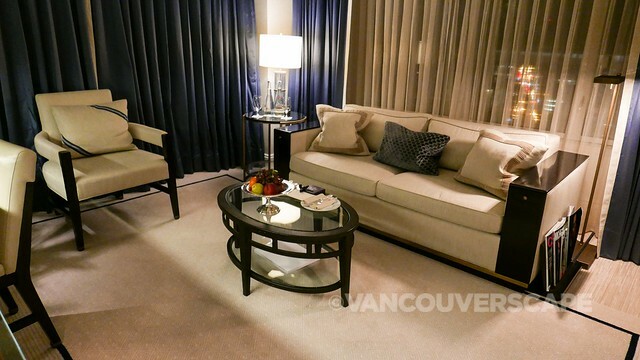 The living room includes comfortable seating with a wood-trimmed sofa containing unique pull-out drink holders, something I’ve not yet come across in my many luxury hotel stays around the world. A full marble and wood-detailed working station includes a large flat screen and AV system for projecting smart phone and computer images and presentations. 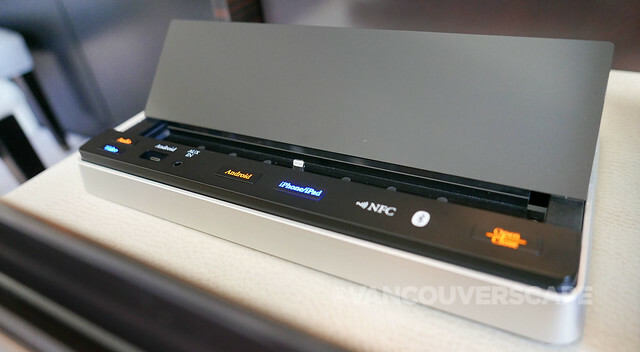 An additional side panel charges both Android and Apple devices via a smart power-controlled button that lifts to reveal the appropriate adapter. 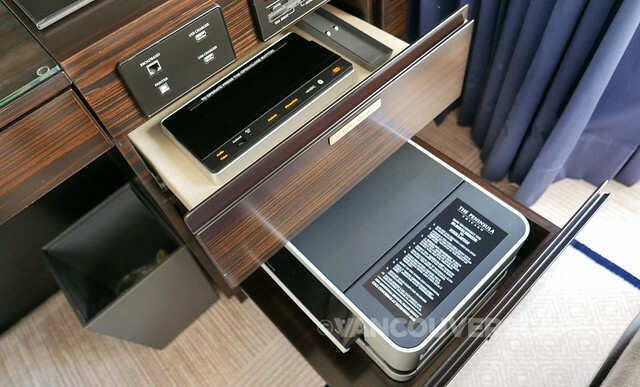 Below is a drawer housing an in-house printer/scanner/fax machine, so you can connect your laptop and work while on the go. What I love most about the room is how silent it is! The airco system is whisper quiet and if you feel for fresh air, all side windows can be opened. And in the bathroom, there’s a Spa setting by the bathtub. 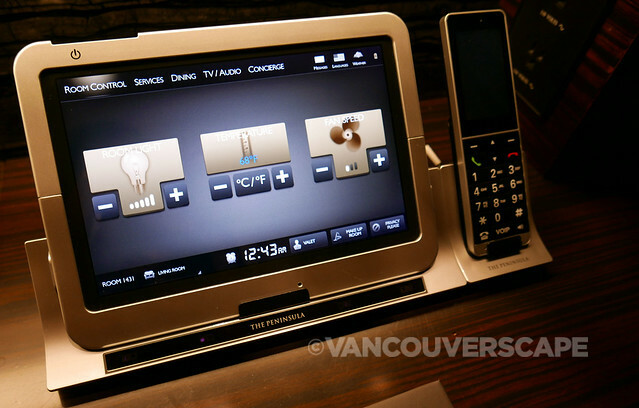 With the press of a button, the lights dim and soft spa music comes on. There are three phones in the bathroom, but if you’re in Spa mode, the music will pause and you’ll be able to answer an incoming call (while in speaker mode), so you need not leave the bliss of your bath. Housekeeping comes by twice daily to make sure everything’s perfect during your stay. I was spoiled with a fresh fruit bowl and gourmet truffles upon my arrival. There’s nothing like fresh fruit to regenerate your system after flying! 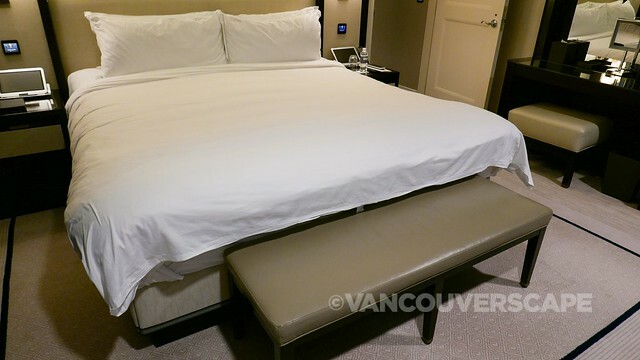 It’s hard to arrive late at night after a full day of travel, but once I got under the sheets of my king bed, I was able to unwind and eventually get some much-needed rest. There’s bedside lighting for a late-night read and touch pads on both sides of the bed to turn off the entire suite when sleep beckons. The hotel staff, restaurant, housekeeping and concierge go out of their way to make sure you’ve got everything you need – and anticipate what you might. Housekeeping noticed my iPad charging on the desk and when I returned back to the room that evening, a new lens cleaning cloth was sitting beside it. Between room service, dining and concierge/front desk hospitality, it’s easy to see why The Peninsula Chicago was recognized by Travel + Leisure in their ‘Travel + Leisure World’s Best Awards’ as the Best Hotel in Chicago. 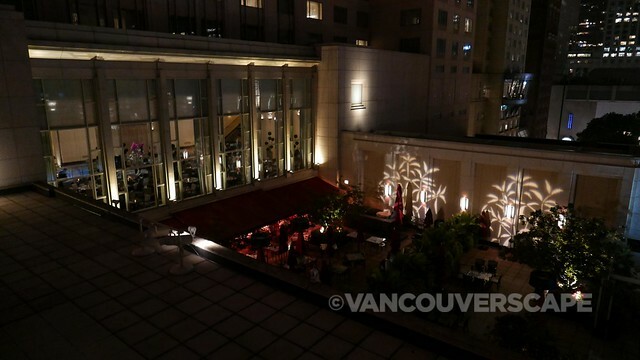 I had several opportunities to dine at The Lobby Restaurant. High ceilings with recessed domes and slender chandeliers accent an elegant room containing dark wooden tables, silver upholstered chairs and gorgeous bright fuchsia orchard arrangements throughout the room. A full breakfast menu and complimentary morning paper greeted me each morning, along with very friendly, service-oriented waitstaff. There are four prix-fixe breakfasts as well as entrees, Belgian (and vegan) waffles, pancakes, cereals and grains, buttery croissants and pastries and fresh fruit, teas and coffee. 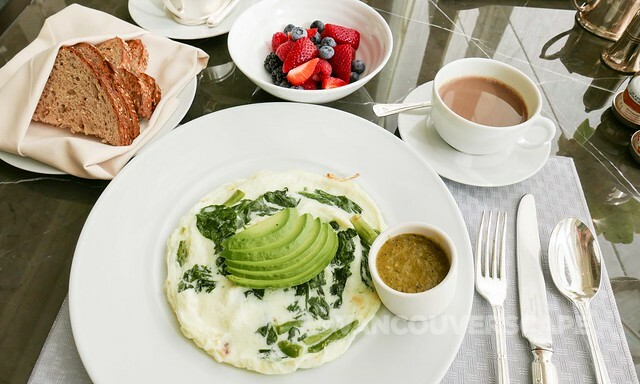 On one morning, I ordered the Green Frittata (egg white, spinach, asparagus, kale, avocado, tomatillo salsa) served with seven-grain toast. The next, I mixed it up with whole wheat pancakes, poached eggs and a fruit plate. The Lobby is open for breakfast, lunch, afternoon tea, Sunday brunch and on Friday and Saturday nights, a chocolate bar, filled with one and two-bite elegant desserts and sweet treats, accompanied by live music. The recently-opened Z Bar offers gorgeous views of Chicago with an elevated bar and cocktail menu. Next to the bar is a new artist-in-residence program that will change seasonally and feature local artists. In winter, the terrace transforms into a 2,000 square-foot ice skating rink (from November to early March). Proceeds from admission ($20, adults; $10, children, including skate rental) are donated to children’s charities. The Shanghai Terrace, rated by Zagat as Chicago’s #1 Chinese restaurant, is open for lunch and dinner seven days a week. 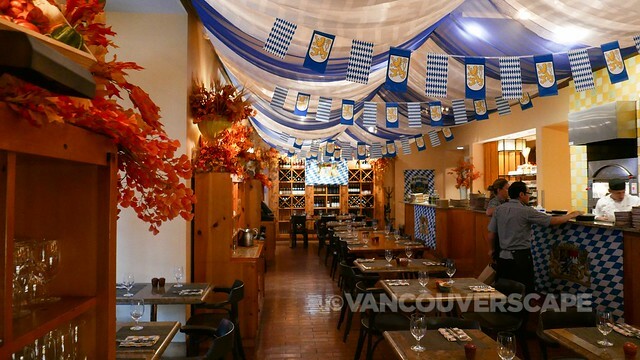 Next door, Pierrot Gourmet is a European style café that features seasonal menus (Oktoberfest is just kicking off), French pastries, a wine menu and other tantalizing dishes. 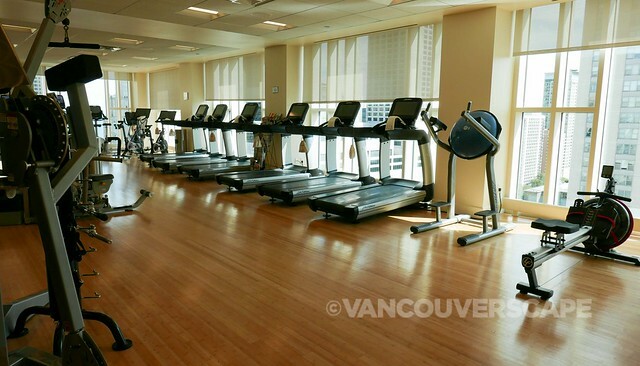 Up on the 20th floor, you’ll find an indoor pool, jacuzzi, spa and gym. One corner of the gym has a partial view of Lake Michigan. Executive Suite guests can reserve a luxury vehicle for up to three hours during their stay, a nice perk for visits to the Art Institute, Millennium Park or dining out. The Peninsula Chicago is located at 108 East Superior Street. My stay was compliments of The Peninsula Chicago. Opinions, as always, are my own. Unless otherwise stated, non-watermarked images courtesy of The Peninsula Chicago.